The tree lined streets of New Orleans are home to the shotgun style of house. Named after a misheard African word shogun that translates to the assembly place, the style grew out of African and Haitian influences and was mainly constructed in the 19th century. These are some of the basic architectural features you find in shotgun style homes. Exterior Looking at a shotgun house, you first notice the porch. Narrow, with a roof apron supported by columns that are embellished by a combination of cornices, spindles, jigsaw or eaves brackets and other intricate moldings. They stand in sharp contrast to the plain look of the style's window less sides, hipped roof and wooden siding. The house itself is set on brick piers because of the flooding that is common to New Orleans. Styles The basic style has several variations. You see duplex and double wide versions, the former, a double-barrel shotgun, being two residences sharing a wall and the latter a single residence that is the size of two standard shotguns. When a second floor is added to the rear portion of the structure it is called a Camelback. More elaborate versions also exist like the Eastlake style that includes gables and the Bracket style with its long overhanging roof. Influences Other architectural styles were adapted into the shotgun style, most notably the Greek Revival and its cousin the Italianate. You can see these influences by looking at the front of a shotgun house. The Greek Revival, with its demand for symmetry, is seen in the equilateral triangle shape of the gable that is set on an entablature and rectangular columns. The Italianate influence is seen with Doric columns under the entablature and a parapet above the porch. In addition, windows and doors employ cornices when this style is evident. Interior Since the house is one room wide and several rooms deep, there is not much variation to the interior. You can see the rear of the house when standing at the entrance on the gable end. Rooms are under 12 feet wide with doors or archways separating them. There are no hallways, so the bedroom is placed at the back of the house, or, in the case of a Camelback, on the second floor. The high ceilings and straight, open design, allow for air flow and ventilation during the hot New Orleans summers. Bathrooms were not part of the original design of this style and when added are placed by the kitchen, or as an addition to the back of the house. 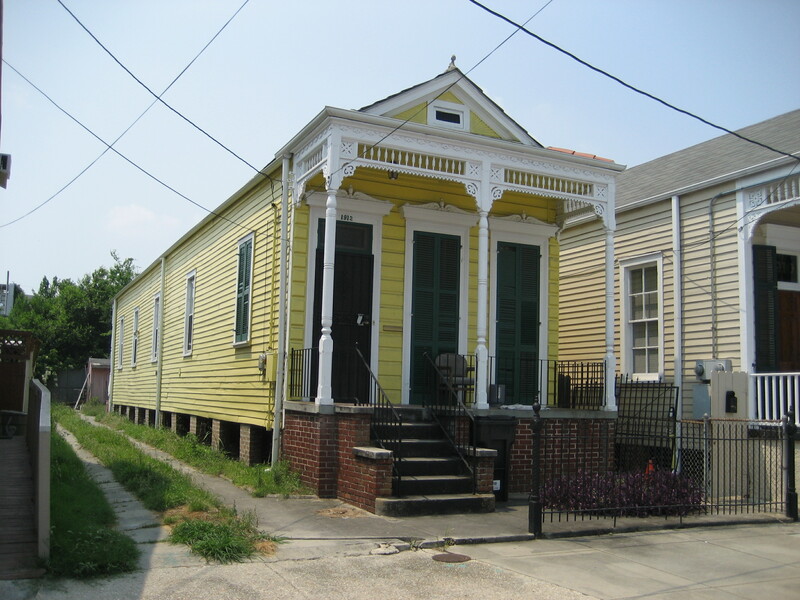 Found in various areas of the Southern United States, the shotgun style house is most notable in New Orleans. It is the only truly African inspired architectural design in America, owing many of its elements to African and Haitian styles. The simplicity and effective use of available space created a functional living space. Over time, you can see other influences exerted on the basic style, adding ornamentation and added functionality. As you drive the streets of New Orleans, notice the many variations, usually by neighborhood, of the uniquely American architectural design.